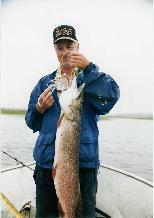 Northern Pike are also known as Jackfish. And you can catch them until your arms hurt in our lake and river systems. Pike are the ultimate eating machines and are a very aggressive sport fish. They can make strong runs and interesting acrobatics near the surface. If you have kids, they are a good choice because they will bite on a rusty tin can but are still a bit of a challange to reel in. It is a good idea to use steel leaders when fishing for pike because their sharp teeth will easily cut through your line. 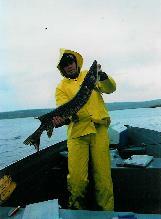 The best location to catch pike are the weedy areas of the lake and on river bends. However you can find pike all over the lake, and they can even be caught right from the main dock. Pike require cold water so the beginning and end of season are the best fishing times for this reason. 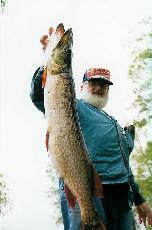 Commonly, pike are in the 15 - 25 inch range, though larger ones are seen regularly at the fish cleaning station. The largest we have seen is the one pictured right, which was 42 inches and 18 pounds. Choose your own schedule� We take bookings for one night to one month's accommodation and fishing. Pick the day of the week the day you would like to arrive and the time of day that suits you.